Casa Poncho is a new Latin destination restaurant and bar in the former Keow Siong Club in Bukit Pasoh. It has a sharing menu with flavours taking inspiration from Latin American countries. Dishes include La Pluma ($12++), grilled Iberico pork from the end of the loin, with caramelised pineapple; Dedos de Poncho ($8++), chilli cheese churros with jalapeno and cheddar; Pulpo Ranchero ($18++), grilled octopus, salsa ranchera, pumpkin seed and scallion oil; Lomito al Carbon ($30++), charbroiled Argentinian beef tenderloin with zucchini, grilled onions and roasted capsicum salsa; and Crispy Chili con Carne ($11++), chilli spring roll with minced beef, avocado, sour-cream foam, chilli, lime, coriander and garlic. Some of the desserts include Poncho’s Flan ($14++), made with horchata, mango, mint and fresh berries; Tentacion de Chocolate ($14++), chilli chocolate, egg custard, and paprika sour cream; and Churros ($8++) with chilli chocolate and cinnamon cream. The bar serves a diverse selection of beverages with signature Mezcal-based cocktails at its heart. Guests can find cocktails such as Gregorio Negrito ($18++), made with Mezcal Reposado, antica formula, Campari and bitters; La Margarita del Poncho ($18++), concocted with Mezcal Alipus blanco, Grand Marnier, yuzu and agave syrup; and Poncho’s Favorito ($18), comprising tequila reposado, dry curacao, Aperol, cranberry and lime juice. A selection of beers and wines are also available. Who is Poncho? Hot New Table Casa Poncho is a new Latino joint in town serving some of the best churros and cocktails in Bukit Pasoh – welcome to Poncho’s crib. Can’t get enough of ceviche, churros and cocktails? Keep your eyes peeled for this one: nestled on the trendy street of Bukit Pasoh, Casa Poncho is the latest addition to the neighbourhood that we’re super excited about. This Hot New Table is a Latin American joint with a Singapore twist – having taken over the ground floor of former mahjong association Keow Siong Club, you’ll see aunties and uncles head up the stairs for their weekly game while you’re just casually sitting at the bar. Come with your girl friends, your work mates, or a fun date, for a night fuelled with Mezcal Margaritas, fabulous bites, and incredible music – Casa Poncho’s vibrant atmosphere will have you feeling transported straight to Cuba. Word on the street is that Poncho loved great food, drinks, music, cigars and movies – and true to form the restaurant is decked out with all the things he loved. Who is Poncho anyway? We’ll get to that later. At the bar, a contemporary Latino mural begs for a photo-opp, while bright graffiti sets the tone. Inside, the main restaurant feels cosy and intimate, with some seriously eclectic artifacts all brought back from Poncho’s travels are displayed all over the place. You’ll find a cigar cabinet filled with all of his favourite cigars nestled in a corner, while his favourite black and white films are projected on the wall. A rowdy live band plays to bring a noisy good time, while Poncho keeps watch from his motorbike. You’ll see. Hungry? You should be. In the kitchen, chefs Geoffrey Weckx and Lee Jin Rong cook up a feast of modern sharing plates bursting with punchy Latin flavour, while friendly waiters dashing from table to table, serving plenty of fare to get you in the mood. Standout dishes include fresh, fresh, fresh French seabass ceviche with avocado twist, Mexican grilled pork skewers with roasted pineapple couli, crispy fried chicken with triple salsa, beef cheek mole with fresh jicama, grilled Spanish octopus with ranchera salsa puree and our personal favourite, Churros de Queso – a crispy yet pillowy chilli cheese churros that we still have dreams about. 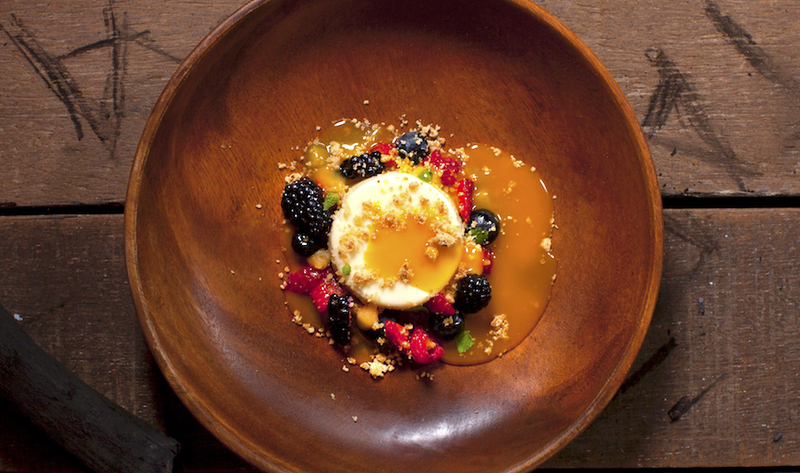 You’ll want to save room for Pastry Chef Sharon Ling’s sweet creations that include a warm weather friendly Horchata Flan with Mango Mint and Fresh Berries. Located within a beautiful shophouse in the heart of Tanjong Pagar, Casa Poncho is a Latin American diner sprawled over four sections: a courtyard, bar, restaurant and terrace. Designed to resemble a country home in Mexico, diners can enjoy their signature cocktails in the courtyard before they retreat into the main restaurant for comfort dishes like the Mexican Grilled Pork Skewers ($12) with roasted pineapple coulis. For those who are fans of seafood, there is a thick and juicy Grilled Spanish Octopus ($36, sharing plate) with ranchera salsa puree on offer, or if you’re in the mood for something lighter, a briny-fresh French Seabass Ceviche ($24) with creamy avocado. Casa Poncho’s apéritifs are made with mezcal, a distilled alcoholic beverage made with agave plants native to Mexico. Be sure to pick up the Mezcal Negroni, made with the mezcal espadin, sweet vermouth, campari and orange. The Poncho Club is also a drink not to be missed, with a slew of ingredients like the mezcal curpreata, ruby port, dry vermouth, blackberry syrup, lime juice, Bittermens’ hellfire habanero shrub (a spicy fruit and vinegar-based syrup) and egg whites. All cocktails at Casa Poncho are $16.